The Alshon Jeffery Hypothesis states that a #2 wide receiver should excel if the #1 receiver is a very, very good receiver. I first thought of this when I was pondering the role that Golden Tate will play for the Seahawks, now that Percy Harvin is coming back and Sidney Rice is out for the season. Many would say that Tate would be worse behind Harvin than he would behind Rice, but this hypothesis proposes quite the contrary. See, Golden Tate’s problem with Sidney Rice being the #1 receiver is quite obvious. Rice stole many targets away from Tate, though he wasn’t good enough to draw double coverage, putting a very capable CB on Tate. Now that Harvin, one of the best wide receivers in the NFL, will take Sidney Rice’s spot, this should be huge to Golden Tate, and lead to an excellent rest of the season for him. While Harvin will, of course, still get a whole lot of targets from Russell Wilson, he will draw a second defender, leaving a lesser CB on Golden Tate. Right now, I’ll prove this hypothesis true by listing some of the “double coverage worthy” receivers, and their backups. As you can see, the backups of these excellent receivers have really played well this season. This is due, largely in part, to the Alshon Jeffery Hypothesis. Every one of these guys draws double coverage for most, if not all, of each game. In fact,for the Giants and Broncos, who both have two #1 threats, sometimes both guys draw the double, leaving an even worse man on the 3rd WR. The average stats of the backups that we previously listed were approximately 394 yards and 3 touchdowns. It is quite evident that these #2 wide receivers have had worse performances this season than the previously mentioned ones, which included Reuben Randle and Eric Decker. The average stats for these backups were approximately 312 yards and 1 touchdown. 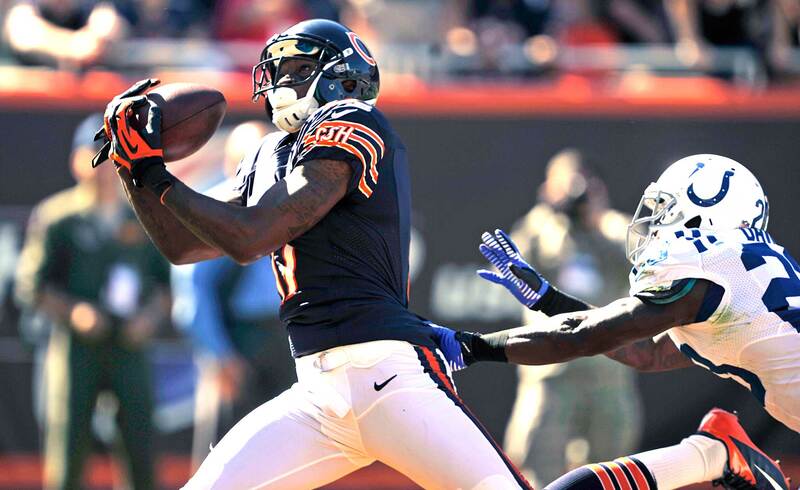 I believe that the Alshon Jeffery Hypothesis points to TY Hilton having a not-so-great rest of the season. Many expect for him to break out, being that he’s out of Reggie Wayne’s shadow, but I expect the contrary. Now that TY Hilton is Andrew Luck’s number one target, he may fall victim to the Alshon Jeffery Hypothesis in two ways: 1) he’ll most likely draw double coverage; and 2) he can no longer rely on the fact that he is facing off against a lesser CB, and will know face the best of the best. If the Alshon Jeffery Hypothesis is of any significance, which I believe it is, Golden Tate should have an excellent rest of the season, and TY Hilton should have a disappointing rest of the season. This entry was posted on October 31, 2013 by smarkowitz1 in Analysis, NFL and tagged #1 target, #2 target, Alshon Jeffery, alshon jeffery hypothesis, double coverage, NFL, receiver, Wide Receiver.